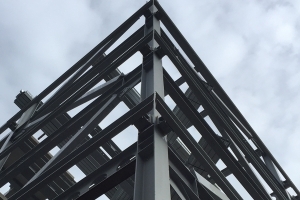 At BSS we can provide In-house Design, Detailing, Fabrication and Erection of Structural Steelwork. The Company has invested considerably in the establishment of Tekla Structures design software and associated hardware, which enables our customers to benefit from shorter lead-times coupled with clear and accurate detailing. Our directly employed draughtsmen are personally supervised by our Technical Director. ‘Complete’ Steelwork packages are prepared ensuring compatibility of details with roofing and wall cladding and other outside trades. BSS can also provide Design, Detailing, Fabrication and Installation of all types of Metalwork including staircases, hand railing and flooring. Our Fabrication Works are situated at Annan, Dumfries & Galloway and are fully equipped with a wide range of plant and equipment to compliment our various activities. Our site activities include steel erection by our own time served personnel.